Antibody Responses In Bangladeshi Children Following Measles Vaccination. Sharmin Sultana Department of Virology, Bangabandhu Sheikh Mujib Medical University, Dhaka. Shahina Tabassum Department of Virology, Bangabandhu Sheikh Mujib Medical University, Dhaka. Afzalun Nessa Department of Virology, Bangabandhu Sheikh Mujib Medical University, Dhaka. Munira Jahan Department of Virology, Bangabandhu Sheikh Mujib Medical University, Dhaka. Keywords: Bangladesh, Children, Measles IgG, Measles vaccination. Measles is a highly contagious vaccine preventable viral disease which mainly affects children. Infection with wild measles virus induces an immune response that provides life long protection. Measles has been targeted for global eradication. In Bangladesh, there is insufficient data about the antibody responses in children following measles vaccination. In the present study, the antibody response of a single dose of measles vaccine was investigated among 77 children of different age groups. The humoral immune response immunoglobin IgG (IgG) was detected by a commercial Enzyme-linked Immunosorbent Assay (ELISA). Among the study population, detectable antibody titer was observed in 75.3% children while 24.7% showed detectable titers. The mean antibody concentration was highest (2.75 ± 1.10 IU/ml) in the 13-24 months age group, decreased gradually with age, and was lowest (0.77 ± 0.13 IU/ml) in the 85-96 months age group. Thereafter, the mean antibody concentration gradually increased again in the 97-108 months (1.20 ± 0.13 IU/ml) and in the 109-120 months (1.45 ± 0.13 IU/ml) age groups. The mean antibody titer was statistically significant in relation to age (p<0.01) but not to gender (p<0.95). 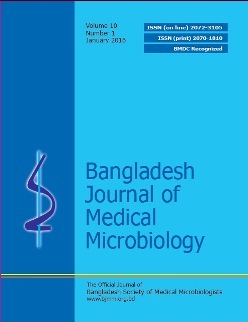 This study showed that around 25% children remained antibody negative indicating challenges ahead for eradication of measles from Bangladesh.